The Pacific Northwest is known for its damp weather and Portland’s winter and early spring weather is no exception. If you’re not a fan of biking in the rain, aim for summer or early-fall trip for your best sunny bets. Maybe you’ve already come to Portland with your bicycle from home, but if not, get a rental at any of a handful of shops throughout the city. I got my road bike rental from Pedal Bike Tours, which also offers a variety of tours – from showing you around the historic downtown to a brewery trail ride. Even though Portland is easy to find your way on your own, a tour is a great way to get to know the city with a pro. Some hotels in town are perfectly happy for you to share your room with your bike. Some even have valet space for your bicycle, which saves you the trouble of making sure you don’t mark up the pretty white walls. When I was cycling in Portland, I stayed at the Hotel deLuxe; the folks at the valet station there stored my bike and had it ready every morning when I left on another adventure. 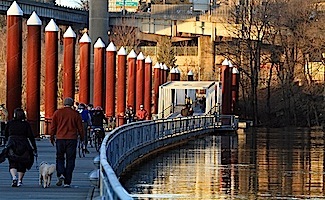 Access to bridges, clearly marked bike lanes, and bicycle boulevards (also called neighborhood greenways) make it easy to get around the city, however it’s not always obvious which is the best route. While they might out you as a tourist, you should use one of the foldable, weather-resistant maps available in most bike shops or at the Travel Portland Visitor Info Center in Pioneer Courthouse Square. You can order the Portland by Bicycle map or neighborhood maps from the city. Also handy is the bicycle feature on Google Maps on your smart phone (after you enter the destination to get directions, click on the bicycle icon for the best directions by bicycle). Prefer a leisurely ramble between popular foodie destinations and shopping? Grab breakfast at The Big Egg on N. Mississippi Avenue, check out the taxidermy funkiness at Paxton Gate, the gourmet salts at The Meadow, visit the Land Gallery (made popular by the "put a bird on it" skit in Portlandia), and explore the vintage treasures at Animal Traffic. From there, head over to The Mash Tun Brewpub on N.E. Alberta Street for a taste of some of the brews that make Portland one of the best beer cities in the U.S. Enjoy lunch at Lardo on Southwest Washington Street and follow up with an ice cream treat at Salt & Straw and or a coffee at Barista. On the other end of the spectrum, perhaps you’d prefer a Portland beer by bike day? For a DIY tour, pick up a copy of Hop in the Saddle, A Guide to Portland’s Craft Beer Scene, by Bike, select a part of the city and follow along on one of the beer routes. Each ride stop has a detailed description, so you can pick and choose if you can’t dedicate yourself to every single part of the route. 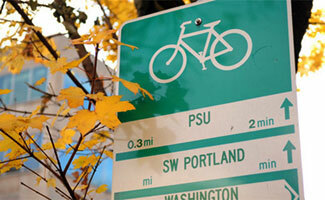 What’s your favorite bicycle route in Portland?